2) Shipping quoted is for the US 48 States Only. US locations outside the 48 states (Alaska, Puerto Rico, Hawaii, US Islands) will have a $5.95 added charge. 3) This set is repackaged into a USPS Flat Rate box and shipped. There is no retail box. 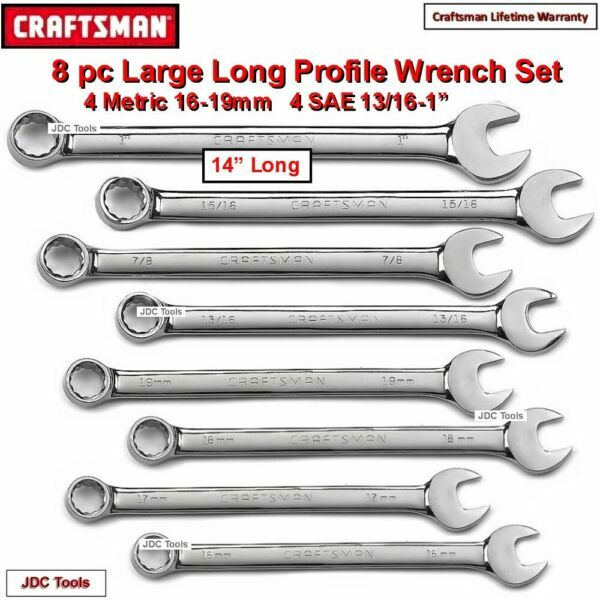 This Craftsman 311 pc mechanic's tool set provides a large range of tool options giving you 311 durable reasons why you should add it to your tools today. The range of tools in this set is extensive. It features most every combination from standard to metric so you won't have to look far to find the right tool. You have the most common ratcheting wrench sizes for everyday bolts and tools to work in tight spaces. Not only does this 311 pc mechanic's tool set give you the variety you've always wanted, the tools also designed to help you work faster and better. With this set, you receive metric, standard, inch and deep well sockets that are made to fit three ratchets. Because changing sockets can slow you down, these ratchets use a release mechanism that releases sockets faster to help you work much more efficiently. You will get ratcheting wrenches, sockets, hex keys, extensions and much more in this one fantastic, reasonably priced set. We have been an eBay member for 12 years with a very high satisfaction rating so buy with confidence (please review our feedback). We welcome your positive eBay feedback and we always provide the same. Please contact us if you feel there is problem before giving feedback and we will do our best to resolve it. Domestic: USPS Priority shipping. Shipping rates quoted are the for the 48 US states only. Other US locations outside the 48 states and those with a PO Address may have a $5.95 shipping surcharge. International: We do not direct ship internationally, but we welcome international buyers using eBay Global Shipping at your own expense. Returns: We take returns within 30 days of purchase. Buyer pays shipping for all returns. A 20% restocking charge will be deducted from any refund amount.